In this section, we will explain the standards that help you find the right glove to suit your needs. The EU 2016/425 regulation has recently been published. It was approved by the European Parliament, replacing Directive 89/686/CEE, and will maintain the general goal of guaranteeing health and safety for anyone using personal protective equipment. 3. 3. Basic health and safety requirements (minimums). • It comes into force on 17 April 2016 except for articles that affect NBs and Committee and Penalties. • It will be applicable from 21/04/2018. • PPE that meets Directive 89/686/CEE and that are put on the market before 21/04/2019 will be accepted. • Standard CE certificates that have not expired will be valid until 21/04/2023. Includes the following minimum risks (superficial mechanical injuries, contact with weakly acting cleaning materials, or extensive contact with water, contact with hot surfaces not exceeding 50ºC., eye injuries caused by sunlight, non extreme atmospheric conditions. Includes risks other than any listed in CAT I and III. Exclusively includes risks that might incur very serious consequences such as death or irreversible damage to health, in relation to the following: health-hazard substances and mixtures, oxygen-poor atmospheres, harmful bacterial agents, ionising radiation, high temperature environments with effects comparable to air temperature of at least 100ºC, low temperature atmospheres with effects comparable to air temperature of -50ºC or less, falling from heights, electric shocks, and working on live installations, drowning, cuts caused by hand-operated chain saws, high pressure jets, gun or knife injuries, damaging noise. This standard is applied to all types of protective gloves intended to protect against mechanical and physical hazards caused by abrasion, knife cuts, perforation, ripping and impact cuts (this does not apply to anti-vibration gloves). Circular test samples of the test material are submitted to abrasion on a known load, as two movements at a right angle produce as cyclical flat movement. Resistance to abrasion is measured by the number of cycles required to puncture the glove. If the glove is made up of different layers, tests will be performed on each layer, and classified according to the sum of the cycles required to puncture each one. The Oakey Glass Quality Cabinet Paper Grade F2- GRIT 100 sanding paper, used to date, is no longer available. We are currently using KINGSPOR PL31B – GRIT 180 sanding paper that is recommended by the technical committee CEN/TC248 WG8 and the Personal Protective Equipment Notified Organisations vertical group. This new sanding paper is more aggressive and it does not perform as well on some materials in terms of abrasion compared to results from the previous material. Test and control samples, prepared and used according to the rules, will be slashed by a standardised circular blade, fitted with alternate movement, in the sequence set for the test, until a cut is made. The mass applied to the blade provides a force of 5N. 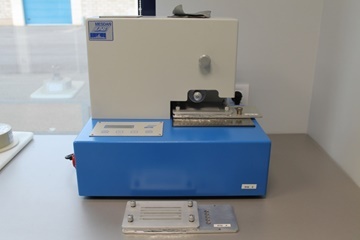 The test sequence will apply it five times, noting the blade-cutting resistance index, classified in compliance with the minimum value, obtaining at least 10 indices to put in the test report. The test method in force is not reliable for cut resistant materials that blunt the blade cutting edge. This is defined as the force required to tear a precut test sample according to the EN388 standard. The tests will be performed on samples that are taken from four different gloves in the same series. 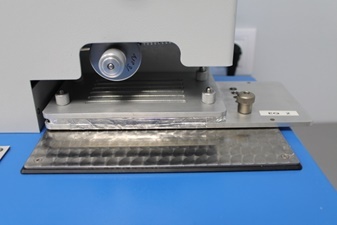 In the case of multi-layer samples, the test will be performed on each layer separately and the classification will be based on the highest value obtained. 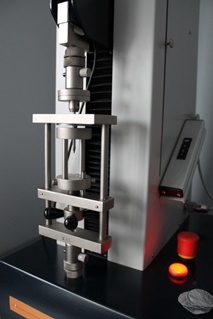 The tearing resistance of each sample is taken as the highest peak registered and the classification is made using the lowest of the four values. 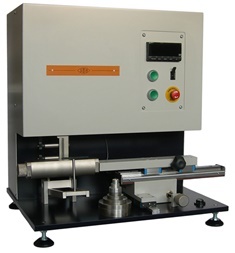 The sample is cut and prepared as set in the EN388 standards, and mounted on a device that holds it centred on the axis of a low inertia compression machine, capable of applying and measuring forces between 0 and 500N. 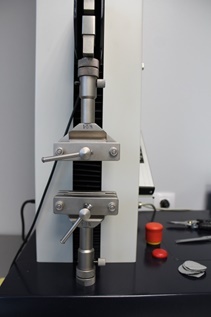 A standardised spike is fitted, centred on the machine axis, that moves towards the test samples with a speed of 100 mm/min up to a distance of 50 mm. The greatest force value applied until the material is punctured will be recorded. It will be classified according to the lowest recorded value out of four samples in the same series. 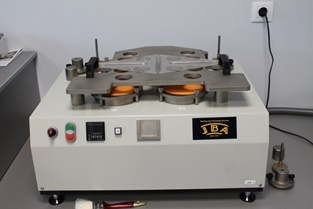 For materials with high cut resistance that blunt the blade, if after the first sequence in the number of cycles Cn+1 is greater than three times Cn in one of the tested samples, the cut resistance test method will be performed according to the EN13997 standard. according to EN 13594:2015 with an impact energy of 5J. The average peak of transmitted force should not exceed 4kN for an individual result and the average transmitted force will be no greater than 7kN. In addition, no area of the glove should be cracked or fissured to produce sharp edges, and the leather chamois between the sample and the anvil should not be torn or punctured. 0 - indicates that the glove does not meet the minimum performance level for the given individual risk. X - indicates that the glove has not taken the test or the test method does not seem to be appropriate for the glove design or material. The EN374 standard sets requirements for gloves intended to protect users from chemical products and micro-organisms. There are two types of tests, penetration and permeability, explained below. The first test to be performed consists of checking for air leaks, so the glove is immersed in water and the air inside it is put under a certain pressure. A current of air bubbles on the glove surface would indicate a leak. Protective glove material resistance to permeation, for a solid or liquid chemical product, is determined by measuring the breakthrough time for a chemical product to pass through the glove material. One of the main new issues introduced by this project is the introduction of requirements to assess the breakdown of the glove when in contact with chemical compounds. Resistance to at least 6 chemical compounds. Resistance to at least 3 chemical compounds. Resistance to at least 1 chemical compound. It is no longer compulsory to test and provide information on mechanical resistance requirements. The pictogram used for all types of gloves is unified and the "Chemically protected" pictogram is no longer used. The AQL parameter was related to the glove's suitability for its use against micro-organisms. As it is excluded from prEN374-1,2016, this parameter no longer has to be provided. prEN374-5:2016 will be a newly created standard fully dedicated to protection against micro-organisms. 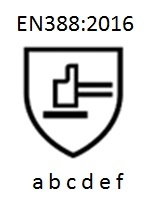 Gloves that also protect against viruses should reflect this in their marking using the word VIRUS under the corresponding pictogram. This standard specifies test methods, general requirements, thermal protection levels and marking for gloves that protect against heat and/or fire. It has to be used for all gloves that protect against heat and/or flames, fire, contact heat, convective heat, radiating heat, small splashes or large splashes of molten metal. The material should comply with the requirements in the table. In addition, the material should not drip or melt. The seams should not open up after 15 seconds ignition time. The PVC film that simulates the skin will not be smoothed or its surface roughness changed in any other way, with any of the quantities of iron used. This standard defines the requirements and test methods for gloves that protect against convective or conductive cold down to a temperature of -50ºC. This type of gloves should meet at least level 1 resistance to abrasion and ripping resistance according to the EN388 standard. water will appear 30 minutes after the test starts. If it passes this test, it will be level 1; if not, then it is level 0. There is no other option. This standard defines the minimum service requirements and the test methods for protective gloves for firefighters. It only applies to firefighter gloves that protect hands during fire fighting operations, including search and rescue. The gloves should be compatible with protective clothing sleeves. Minimum service provision level 4 should be obtained (post-combustion time ≤ 2 s and a post-incandescence time of ≤ 5 s). If the material melts, it should not form droplets. The stitching in the area where the flame is applied should not open up after 15 seconds of exposure. This should obtain a time T2 of 15 seconds, as a minimum. With a contact temperature of 250ºC, the arithmetic mean of the three values for time t1 is calculated and rounded off to the nearest whole second. A time T1 of 10 should be obtained for a minimum classification of s, as a minimum. The lining material closest to the skin should neither melt nor drip. Minimum service provision level 1 should be obtained. Gloves tested according to Ruling 10/2011 for food.